NS, the state-owned Dutch rail operator, is in the process of completing a project to improve the passenger information systems on one of the densest rail networks in Europe by using wireless internet connectivity for more efficient and up-to-the-minute reporting. The company runs 5000 trains a day serving around a billion passengers a year. In the last couple of years, half the fleet out of a total of 365 intercity trains have already been fitted with wireless internet services and real time travel information systems through rail communications specialist Nomad Digital. During the course of 2013, all NS intercity trains will boast these services, making it the world’s largest project for rail connectivity to date. Real-time travel information is offered via 5,500 screens and automated messages on the passenger announcement system which inform up to 600,000 passengers a day about their journey. It means that passengers can now get instant and reliable travel information regarding train destinations, connections and arrival times on-board the train. Across the Netherlands’ 4,700 km of track and 400 stations trains can travel in both directions on the same line every few minutes, which can make travel information quite challenging. There are also many more stops compared to most intercity rail routes, with average journey time only 37 minutes, or just 11 minutes on local trains. Displays visible on the side of trains and multiple screens inside every carriage are updated over the internet in real-time and the passenger announcements are also controlled by the Nomad technology. Travel information can even be presented on your smartphone and can be seen on the train landing page when browsing the internet from the comfort of your seat. The service is free to all passengers. Reactions to the service have been extremely positive, both from passengers and its ten thousand employees. “The number of users is increasing a lot as people get more familiar with it,” says Leon Jansen, head of IT operations at NS. So far, nearly a million unique sessions have been accessed by people using the internet. Average online usage time is 40 minutes on trains. The wireless internet service has been designed not to be overloaded through excessive use, based on the maximum number of 100 passengers in each carriage. Nomad has optimized the service for multiple users – for instance, on double-decker trains – so that people can work seamlessly, with all access points able to carry 250 unique sessions. Heavy demands on bandwidth, such as passengers downloading films, aren’t yet allowed. “The Nomad solution gives us a future-proof platform, so the IT department can implement existing functional goals like tracking and tracing, or train diagnostics, in a controlled way,” says Cor van der Hoop, business consultant of IT operations at NS. Overall, NS believes that the project through Nomad Digital has given the rail company the means to provide better information to customers. It also claims increased passenger satisfaction on those trains with internet access. However, other benefits of the system include being able to monitor data acquired via the wireless network, such as on-board air conditioning or toilet systems, which can save considerably on maintenance work and running costs. 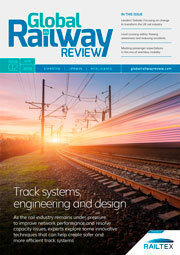 “Internet connectivity represents another step towards train and IT integration, with real-time monitoring becoming key and remote maintenance in future possible anywhere, anytime,” says Jansen.